To be sure Bowles’s characters are not sympathetic, as his novels aren’t psychological in the conventional sense. To the extent you’re encouraged to identify with Kit and Port it’s to be alienated by the hostile environment through which they travel. His books are more gothic in sensibility, in that everything — landscape, weather, language — is in the service of an overall menace, in this instance existential in narture, though I disagree that his prose is ornate. It is measured and descriptive, but much more utilitarian than florid. I don’t know, dude, it’s a pretty great book. If you’re interested enough to continue reading him, I can highly recommend his stories, which many see as his true accomplishments as a writer. But many of them are going to distill this same combination of unlikeability and unease, down to an LSD-blotter-sized droplet. I love the tone you take in this review- you’re a funny man, Ed Champion. I too would recommend his stories. And I too thought it was a pretty great book. Harrrowing, but great, And that scene you describe- that hotel, and then the weevils in the soup- that was hilarious. I read that out loud to my husband. It has been a while since last read this novel, but–if I recall correctly–the novel stands out as a thinly disguised mea culpa for white man’s guilt (i.e., the undiluted shame of the white man’s selfish exploitation of North Africa and other sites of European colonialism); hence, within the politically charged narrative, there are no good outcomes for the tourists/intruders (not one of which is particularly admirable or deserving). Of course, perhaps I should have another look at the novel in light of your intriguing commentary. Erik got it right. Bowles, in my opinion, is less interested in selling you “nice” characters doing interesting things than he is in showing you all the facets of alienation any human might experience: alienation from a spouse, a friend, a country, a people, and most of all oneself. 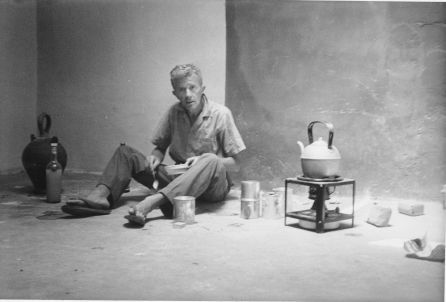 The book seems to me a meditation on essential existential questions, with the climate and country of North Africa as much a character as Port or Kit. A re-read of Sartre’s “Nausea” would be a good primer for this novel. But muffs or no muffs, stay away from that god-awful movie. I almost had to re-read the novel just to cleanse my palate. seeking background for Prokosch’s TWO PEOPLE . . . . Thank god I’m not the only one who found the movie depressing, sickly, and completely un-moving. Waste of celluloid on self-indulgent posturing with no heart.